Canton, Mass. (May 4, 2012) – Baskin-Robbins, the world’s largest chain of ice cream specialty shops, today announced plans to greatly expand the brand’s presence in the UK. 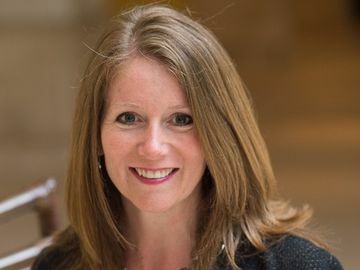 The firm is looking to nearly double its number of locations in the UK with the addition of 80 new free-standing restaurants over the next three years. The announcement comes as Baskin-Robbins celebrates the official opening of three new shops in London. Nigel Travis, Chief Executive Officer of Dunkin’ Brands, Baskin-Robbins’ parent company, and Giorgio Minardi, President of Dunkin’ Brands International, are in London this week to attend the opening celebrations. 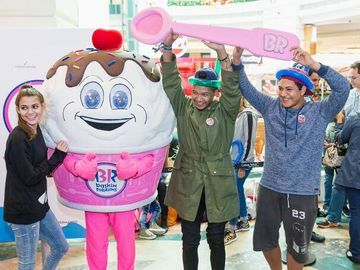 Baskin-Robbins currently has almost 100 locations in the UK, including free-standing restaurants as well as concession locations in other shops and movie theaters. On a worldwide basis, Baskin-Robbins has more than 6,700 locations in nearly 50 countries around the world. In addition to its planned expansion in the UK, Baskin-Robbins also recently announced its entry into Vietnam and further expansion in Mexico. The three new venues in London will feature Baskin-Robbins’ new international restaurant design, which includes relaxing lounge-style seating, textured walls reminiscent of Baskin-Robbins waffle cones, an expanded topping station, interactive LCD menu displays and improved dessert displays for modelling ice cream cakes and sundaes. 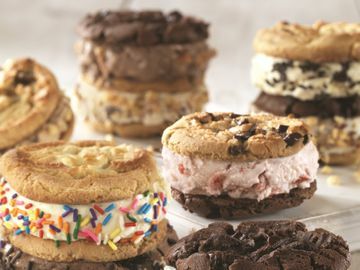 The shops will offer classic Baskin-Robbins ice cream flavors including Mint Chocolate Chip, Pralines ‘n Cream and Jamoca® Almond Fudge, as well as local flavors like English Toffee. The restaurants will also carry Baskin-Robbins’ wide array of frozen treats, including ice cream sundaes, ice cream cakes and frozen beverages. For more information about Baskin-Robbins, please visit www.baskinrobbins.com or follow us on Facebook (www.facebook.com/BaskinRobbins) and Twitter (www.twitter.com/baskinrobbins). Named the top ice cream and frozen dessert franchise in the United States by Entrepreneur magazine’s 31st annual Franchise 500® ranking, Baskin-Robbins is the world’s largest chain of ice cream specialty shops. Baskin-Robbins creates and markets innovative, premium hard scoop and soft serve ice cream, custom ice cream cakes and a full range of beverages, providing quality and value to consumers at more than 6,700 retail shops in nearly 50 countries. Baskin-Robbins was founded in 1945 by two ice cream enthusiasts whose passion led to the creation of more than 1,000 ice cream flavors and a wide variety of delicious treats. For the full-year 2011, Baskin-Robbins' shops had global franchisee-reported sales of approximately $1.8 billion. Headquartered in Canton, Mass., Baskin-Robbins is part of the Dunkin' Brands Group, Inc. (Nasdaq: DNKN) family of companies. For further information, visit www.BaskinRobbins.com.